* File should be 150dpi or higher at size. * Smaller files should be submitted at 300 dpi. * Large files can be submitted at 100 dpi. Microsoft Word or Excel; text will be copied + pasted. 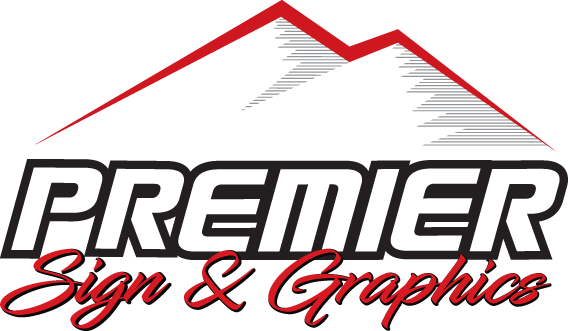 Vehicle wraps should be saved to an accurate template (Check with Premier Sign & Graphics to see if we have the correct template for your Make, Model, and Year vehicle or created from a photo + measurements). Wrap artwork should be ≥72dpi and in Illustrator or Photoshop only. Artwork must provide for the curvature of the vehicle as well as 6″ to 10″ extending beyond the edge of the vehicle. Text should have bleed enough around for flexibility in installation to move graphics to fit vehicle body lines, openings, etc. Sometimes we must print and cut some of the text separately from the wrap, so please consult with Premier Sign& Graphics for direction in creating the wrap, or allow us to do it from your components. File sizes under 10mb may be emailed or uploaded on this page. Sizes under 30mb may be uploaded on this page. Sizes OVER 30mb please call for details.